The advent of the cloud and the proliferation of web apps have truly changed the technological landscape for businesses. At Intuit®, we understand and appreciate the necessity to embrace these advancements, in order to keep pace with customers’ expectations. 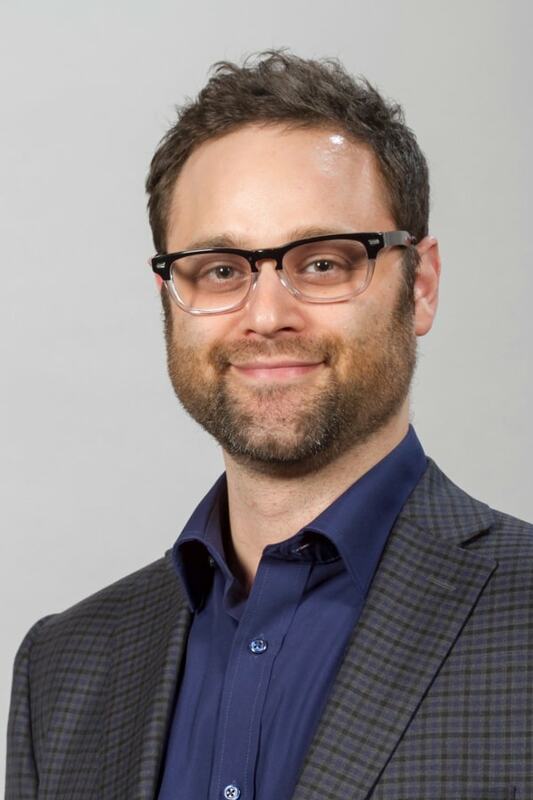 In fact, one of my favorite ways we stay current with (if not ahead of) technology trends is through QuickBooks® Labs. This is the place where we experiment with potential* plug-in features for QuickBooks Online (QBO), where customers have the opportunity to try them first and then provide their valuable feedback, opting in or out with a swipe of the on/off button in the Labs page. It’s that simple and that cool. With this in mind, I’m excited to introduce one of our new features for QBO users in Canada, U.K., Australia and the U.S.: QuickBooks Online Projects. “Do you want to see how many hours you worked on a project, or the number of employees working an event at one time? Need to organize all your projects in one location? Run reports – make notes? Then, QuickBooks Online Projects is really the program for you and your business,” says Janice Figov, a Certified Adult Educator who specializes in training people in QuickBooks, and the owner of Accounting Solutions Trainer. She is all about making learning fun, but her business motto is clear: ‘No Nonsense Training, We Cut through the Bull.’ With over 20 years’ experience in the industry, Janice is well versed in both QuickBooks and in what constitutes a useful bookkeeping and accounting application. Before reading these tips, check out QuickBooks Online Projects for yourself. I think you’ll find that it’s not only extremely helpful in organizing the pieces that make up your project, but also allows you to access those pieces quickly and in one place. There’s no reason to use multiple apps to run your project when you can do it all within QBO with Projects. 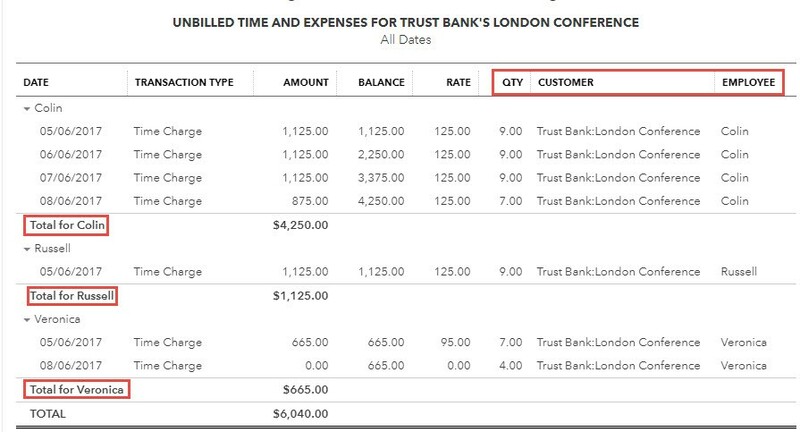 Figov uses an example client, Trust Bank, to showcase her tips for using QuickBooks Online Projects. 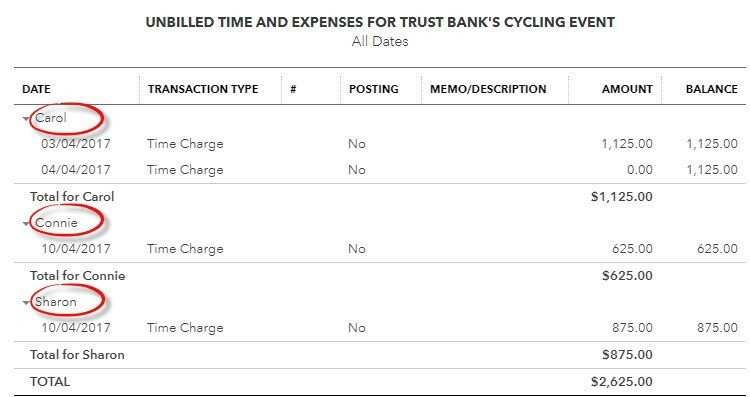 Check out a screenshot of Trust Banks’ multiple projects grouped together, providing a clear picture of what is happening and when. “Because you need to track how many hours and how many employees you have working on a project, you can easily run reports on that particular event. And, it’s important to know that reports can be customized,” Figov says. It’s also imperative to have the ability to run reports on how well you did – or did not do – on a project. QuickBooks Online Projects allows users to assess the profitability of each project. 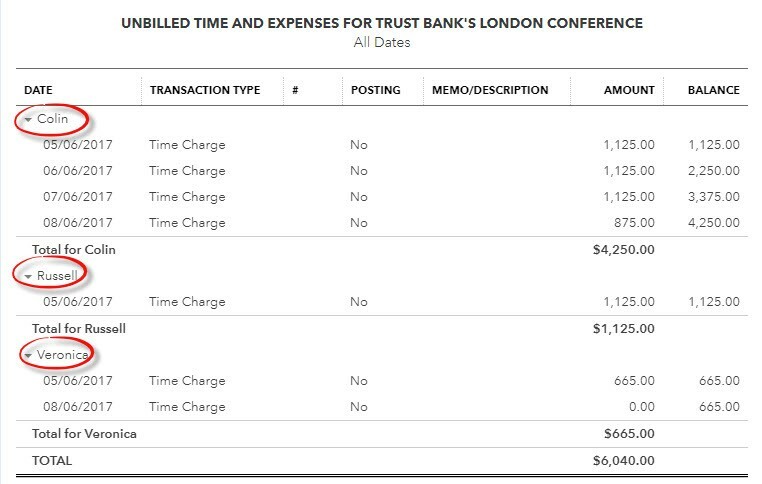 Here’s a look at the Unbilled Time and Expenses report for another of Trust Bank’s projects. Figov customized the report to display Hours (noted as QTY), as well as the Customer and the Employee. Figov notes that invoicing with QuickBooks Online Projects is as simple as going to Add to Project and selecting Invoice, and then watch the project name pre-fill for you. You also have other invoicing options, such as Group Time by Service or Don’t Group Time. 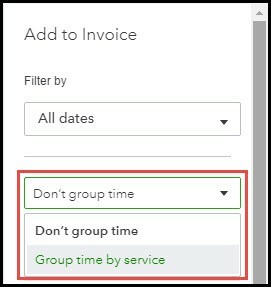 With Don’t Group Time, you can select which individual time you want to add to your invoice, as indicated below. And, with Group Time by Service, you are able to combine all of the hours you and your team have spent on the project. Lastly, Figov explains that there’s no need to search if a project has been completed. Once it’s marked as Completed, it shows up automatically on the dashboard, as shown below. If you want the ability to review your active projects, add transactions and get project-specific reports in a timely manner from a single location, then I hope you’ll give QuickBooks Online Projects a try. It can truly make a big difference in the success of your projects. *Because QBO Projects is part of our QBO Labs and still in the experimental stage, there’s no guarantee it will become a permanent feature; it’s subject to removal without notice. Your feedback will play a part in determining QuickBooks Online Projects’ future!